It’s a great song. But is it really true that crying won’t help and can’t change anything? Maybe there are more ways of looking at what happens when we get tearful. Because there are situations when crying makes us feel worse; and yet in other situations crying can make us feel soooooo much better! First, let’s get clear on the difference. Then you can start to figure out some ways to make your tears the ‘feel better’ kind, more of the time. First off, when does crying make you feel worse? You are unconsciously using crying as a ‘cover feeling’ so that you can avoid feeling or doing something important. For example, some people cry when deep-down they actually feel angry but are too scared to feel the anger or to set a healthy boundary with someone (Note: this can happen the other way round, too). So, What Should You Do if Some of These Apply to You? First, don’t try and suppress your tears. Crying, in itself, is not your problem. Instead, view your tearfulness as a sign that something needs to be attended to. If your crying is making you feel worse, and two or more of the above list applies to you, it might be a good idea for you to consult with your physician/GP to identify if there could be something going on that needs attention (perhaps a hormonal imbalance or other physical problem; or you may be suffering from depression or anxiety). Improving your sleep, getting some exercise, and being well-nourished can also make a big difference. Seeing a therapist or counsellor for a while could also be extremely helpful for you. Your therapist can help you identify what needs to change, and what you could do. The needed changes might be internal (an inner mindset shift, some emotional processing work, or healing from trauma), or external (such as a relationship that is bringing you down, discrimination, bullying, or a social justice issue that needs addressing). Often, it will be a combination of both. Your therapist can also provide much-needed support and guidance through the process of change. Make sure you pick a therapist who you click with, and can feel safe and supported with, because the quality of the relationship will directly impact your body’s stress response, affecting the amount of brain-change that can happen. So How Can Crying Make You Feel Better? Here’s the thing: Crying can also make you feel better. By ‘feel better’ do I mean ‘happy’? But mainly by ‘feel better’ I am talking about feeling more whole, more connected, more understood. 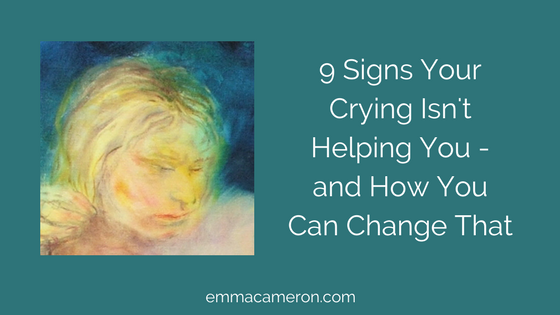 Crying can make you feel released, and relieved. It can make you feel more truthful to something authentic within. 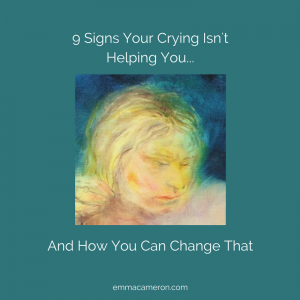 And crying can help you trust your own growing ability to express your feelings in a way that feels safe and appropriate, and not out-of-control. How to do that? That’s the subject of my next post, ‘How to Feel Better from Crying – a 4-Step Process’. We experience losses all the time. Sometimes they are small, like losing keys or gloves. Sometimes they happen slowly, over time, like losing youthful skin, a firm bottom, or muscle tone. Sometimes a loss can also be a gain (“My baby is all grown up!”) and we’ll have all sorts of mixed feelings, both tearful and delighted. And sometimes, as you already know, a loss will be profound and devastating and life-changing. Some losses need to be grieved deeply, over time. And revisited again and again until the grief feels different in quality, and not as urgent. And crying is a very necessary part of the grieving process. When we are able to cry freely, in the presence of someone who is able to calmly, caringly be alongside us and hold the space for us to weep and wail and rage and lament, we are allowing the grieving process to unfold at its own healing pace. If you’re a highly sensitive person, you may have a natural tendency to weep very easily. If you’re lucky, this wasn’t frowned on when you were a child, and so you learned to simply accept it as part of who you are, without judgement or difficulty attached. But if you’re less fortunate, you may have endured a lifetime of complaints, criticism and even being bullied for being a so-called ‘crybaby’. If this happened to you, getting teary might be bound up with feelings of shame and and an all-pervasive vague feeling of ‘something’s fundamentally wrong with me’. You can help yourself by learning more about the HSP trait (start here, on my Highly Sensitive Person page). Some HSP’s (just like many non-HSP’s) tried so hard to suppress their crying when they were young, that they became too successful at it, ending up being unable to let themselves cry when they needed to. Highly sensitive people can do really well with the right support, whether that’s from understanding friends, loved ones or an HSP-knowledgeable therapist. An important warning for parents: don’t use your child as someone to cry on (unless both you and your child are grieving a loss together and are well supported by another adult). It can be overwhelming and damaging for a child to feel that their parent requires them to be an ongoing emotional support. This applies even if your child appears to be a steady, dependable kind of kid. And be careful: if it looks like a child is the mature ‘adult one’ in the family (when compared to the adults) this could possibly be a red flag indicating potential problems further down the line. When you get used to crying when it feels necessary and appropriate, you gradually discover the variety of experience that crying can offer. You’ll find that weeping, sobbing, tearfulness and being moist-eyed can feel different, and have different significances to you, at different times. Sadness will just be part of a tapestry of ever-moving feelings that you freely experience, and not a huge inner stone weighing you down. You’ll become more able to deepen your experience of living, and express yourself with greater confidence and clarity. In my next post, I take a look at the 4 steps you can take that can help you feel better from crying. I Sat by the Ocean lyrics © Kobalt Music Publishing Ltd. Does your crying help you feel better – or does it only make you feel worse? Maybe you can share what you’ve found helps you to feel better from crying – just leave a comment below!